Chilton County is a county located in the central portion of the U.S. state of Alabama. As of the 2010 census, the population was 43,643. The county seat is Clanton. Its name is in honor of William Parish Chilton, Sr. (1810–1871), a lawyer who became Chief Justice of the Alabama Supreme Court and later represented Montgomery County in the Congress of the Confederate States of America. 25.70% of the population were under the age of 18, 9.10% from 18 to 24, 29.00% from 25 to 44, 23.40% from 45 to 64, and 12.90% who were 65 years of age or older. The median age was 36 years. For every 100 females, there were 97.80 males. For every 100 females age 18 and over, there were 93.90 males. The County Commission is made up of seven members elected by cumulative vote (CV). "Chilton County adopted cumulative voting in 1988 as part of the settlement of a vote dilution lawsuit brought against its previous election system. According to the 1990 Census, African Americans constituted 9.9% of the county's voting age population." Although passage of the Voting Rights Act of 1965 enabled African Americans to register and vote, in Chilton County no African American was elected to the County Commission until the first cumulative voting election, held in 1988. African Americans in Alabama had been essentially disenfranchised by the 1901 state constitution, which required payment of a poll tax and qualification by a literacy test in order to register to vote. Discriminatory in practice as administered by white officials, this system excluded most blacks from the state's political system for decades in the 20th century before Congress passed the Voting Rights Act of 1965. Since then, African Americans were able finally to register and vote in the county and state for the first time since the late 19th century. In counties in which there is a minority population and members are elected at-large or by single-member districts, minorities may be unable to elect representatives in a system dominated by the majority. The adoption of cumulative voting in Chilton County has enabled the minority to elect candidates of their choice by pooling their votes. Bobby Agee was elected as a Chilton County Commissioner in 1988 and again in the second cumulative voting election in 1992. Cumulative voting depends on a multi-seat election, whether at-large or by district. "The cumulative options provide a minority of voters an opportunity to concentrate their support for a candidate or candidates more effectively than they can under the more traditional voting rules used in this country." In 2014, the county commission had an African-American commissioner among its seven members. However, in 2018, the county commissioners were all white males. The commission hires a County Administrator to handle daily management of county business. ^ "Centers of Population by State: 2010". United States Census Bureau. Archived from the original on January 3, 2014. Retrieved May 15, 2014. ^ "Central Alabama Genealogy". Retrieved 2012-04-30. 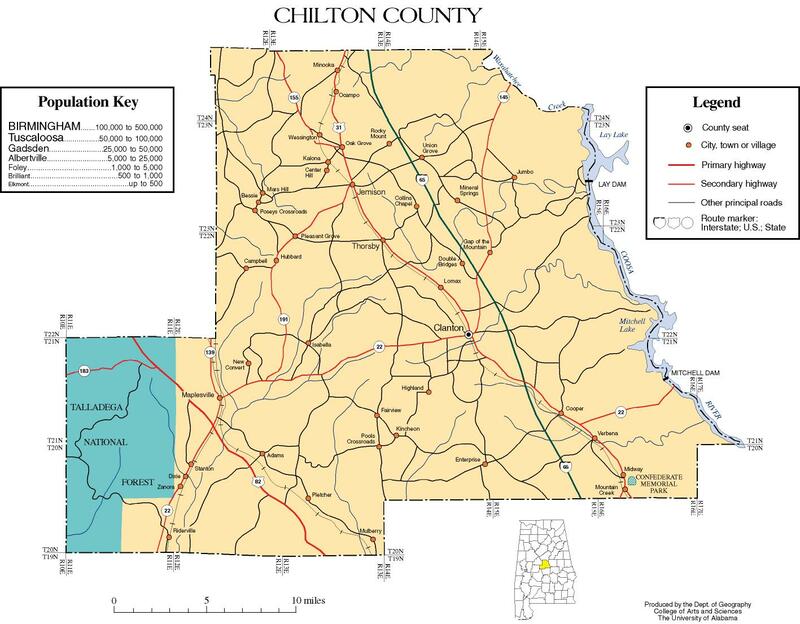 Chilton County map of roads/towns (map © 2007 Univ. of Alabama). This page was last edited on 8 March 2019, at 12:58 (UTC).